All about cast iron and how to take care of it. In the world of culinary equipment, cast iron sits upon a pedestal. For generations, it’s been turned to as the pan-material of choice for anything from the perfect steak to the ideal fried egg. It’s loved for its ability to deliver a great sear, to conduct and maintain heat well, and to transition easily from stovetop to oven. But for some reason, caring for cast iron is perceived as daunting—as though this tough-as-nails material requires us to treat it with kid gloves. 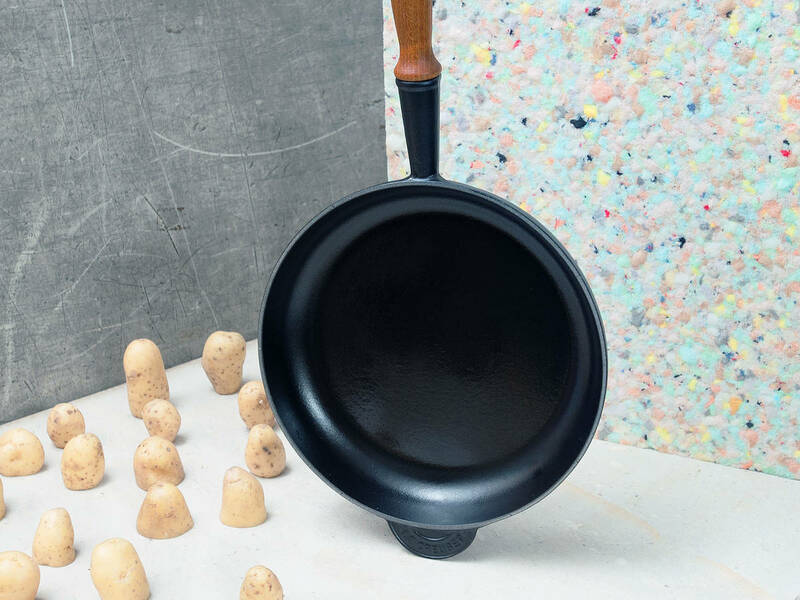 On the contrary, cast iron is remarkably durable and resilient—that’s why a pan can be passed down over generations and can bounce back from even the worst treatment. Seasoning a cast iron pan does not refer to infusing it with the aroma of herbs and spices; rather, a seasoned cast iron pan is one with a thin layer of polymerized oil that has bonded to the metal, creating a non-stick surface. This seasoning is created when cooking oil is broken down over time into a plastic-like substance with non-stick properties. The more you cook with your pan, the more non-stick it will become and the better it will perform. To season a new cast-iron pan, preheat the oven to 150°C/300°F and place a sheet of aluminum foil on the bottom of the oven to catch any grease that drips down. Coat the pan with about 1 tbsp. of lard, bacon grease, or vegetable shortening and place the pan on the top rack of the oven for 10 minutes. Remove pan from oven and pour out any excess grease, then turn the pan upside down and return it to the oven to bake for about an hour. Turn off the oven and let the pan cool inside. Repeat the process when needed to maintain or intensify the seasoning. Many people instruct to avoid the use of soap when washing cast iron pans. However, soap will not harm the polymerized oil that has coated your cast iron pan. First, use a paper towel to remove the accumulated cooking grease from the pan, then gently scrub with soap and hot water, and dry immediately. What will harm your pan is leaving it to soak, which can affect its seasoning and cause the pan to rust. In general, try to minimize the time between washing and drying your pan so as to avoid this. A great natural way to scrub off stuck-on food is by using a halved potato and some salt. Simply sprinkle some salt over the pan and use the cut-side of the potato to scrub to loosen the accumulated food stains. Cast iron is ideal for searing and creating crisp edges thanks to its ability to conduct and hold heat. It’s even great for baking anything from skillet cookies to cornbread to crumbles. When you are first starting to cook with a new pan, it’s best to begin with high-fat foods that will help with the seasoning process. In general, what you won’t want to cook in your cast iron pan are foods high in acidity, like citrus, vinegar, and even wine in some cases, that will be simmered for prolonged periods. In a well-seasoned pan, the addition of acidic foods for a short simmer should not cause any issues, since the polymerized oils create a protective layer between the acid and metal. However, in an unseasoned or poorly seasoned pan, the acid will react with the metal, resulting in an unpleasant, metallic taste. And, when simmered for long periods, the acid will begin to strip the seasoning from the pan.